We made a road trip from Melbourne to Sydney along the coastal road and started driving from Melbourne to Wilsons Promontory National Park. This was our grand Australian tour and we wanted to drive slowly, see Australian nature and stay the nights in the most scenic places we could find. Wilsons Promontory definitely was one of those places. We were traveling with a campervan that we rented in Melbourne. On the way to Wilsons Promontory we stopped at wineries, walked on pretty beaches and explored many small seaside villages along the Victorian south coast. And there was the Bunurong Coastal Drive where we walked on a rocky shoreline and examined strange fossils that were millions of years old. This is the driving itinerary from Melbourne to Wilsons Promontory. It’s a four hour drive, less than 300 km. You can begin your trip touring the wine area of Yarra Valley and the spectacular Dandenong Ranges where you can walk in a rainforest. The Yarra wine area is famous for its beautiful scenery, vineyards and tall ash trees. 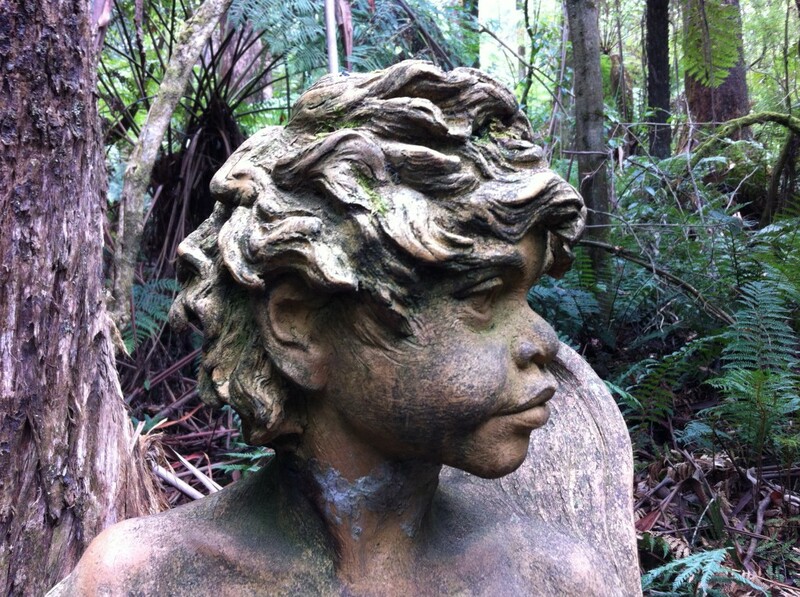 And there is the famous Healesville Sanctuary where you can see native Australian animals. Phillip Island again is famous for its cute little penguins but there is much more to see. You can visit Australia’s oldest farm and walk along the rocky shoreline making acquaintance with Australian kangaroos. In fact this one is a wallaby, wallabies are small kangaroos. Once you reach the Victorian south coast you start driving east. It’s all open farming landscape, with rolling hills, small villages and pretty coves. Our first longer break was on the Bunurong coastal drive. After about two hours driving from Melbourne we took a small side road from Wonthaggi to the tiny village of Cape Paterson and on to another village, Inverloch. Between these villages is a rugged coastline with soft sandstone cliffs and beautiful sandy coves. The road follows the rocky coastal headlands. It’s so narrow so you don’t know where to stop. But they have made small roadside parking spaces meant where you can stop for the views – if you have a small car. Click on the small photos to see them in a slideshow. However we couldn’t stop at any of the cliff top car parks because our campervan was too big for these spaces. Finally there was a big parking area. 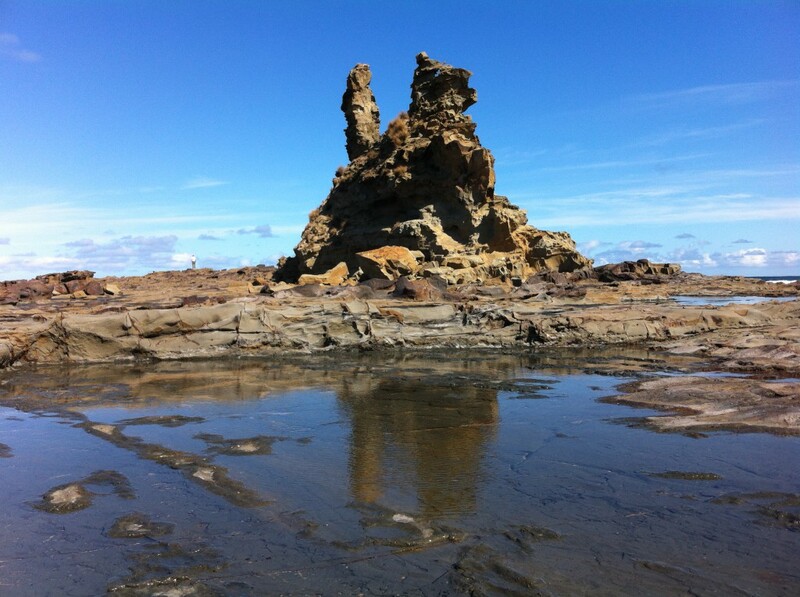 That was atEagles Nest, the most famous attraction of Bunurong. At Eagles Nest we found very strange rock formations and a beautiful sandy beach, and we had a walk on the rocky shore. The sandstone here is more than 120 million years old. From archaeological point of view the Bunurong area is the most interesting. More than 10 000 bones of dinosaurs, mammals and fish have been found here and you can see ancient fossils almost everywhere on the rocks. Beautiful! From Bunurong it was still a long drive to the southernmost edge of continental Australia, a peninsula that has the much liked national park of Wilsons Promontory. The area is famous in Australia for its varied landscape and good walking opportunities. We stayed a night at Tidal River camping that is a lovely place and so popular among Australians that all bookings during holiday seasons must be made months before. 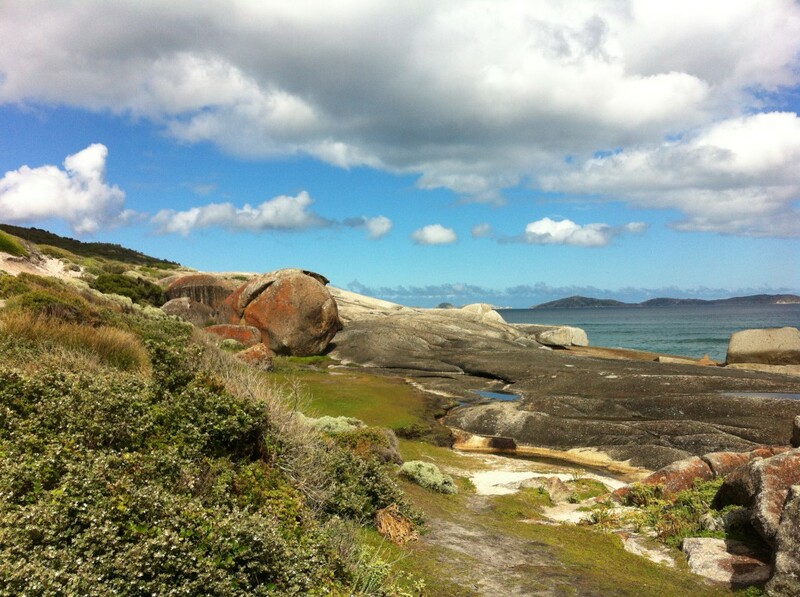 Wilsons Promontory is ideal for both short and long walks and there is a direct access to the best walking paths from the camping. 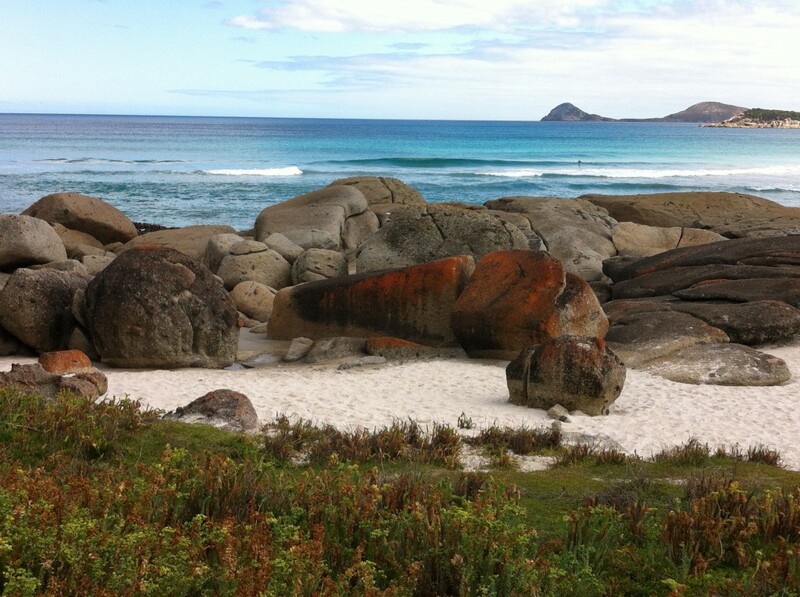 We didn’t have time for more walks than the Squeaky Beach Walk from Tidal River, but it really was a great hike. The sand on Squeaky Beach is so white that you would think it’s snow – but unlike in winter landscape you can see dark stones beyond the beach. The Squeaky Beach track was partly bush walking on the hill, and partly open landscape with wonderful views to the sea, beaches and Tidal River. Wilsons Promontory has a lot of native wildlife. On the Tidal River Campground we had wombats, possums, kangaroos and rosellas as well as other birds around our campervan. In other parts of the national park we spotted big emus grazing and also small echidnas crossing the road. Driving in this part of Australia is great fun but sometimes very slow. The terrain is hilly, and even the main roads from Melbourne to Sydney are winding and sometimes very narrow – and they go straight through the smallest settlements and not round them! And there are lots of old narrow bridges where you have to stop. This all means driving takes so much more time than what you count with. But we had time! We wanted to travel slowly and many times we voluntarily took the smallest country roads in stead of the main road. 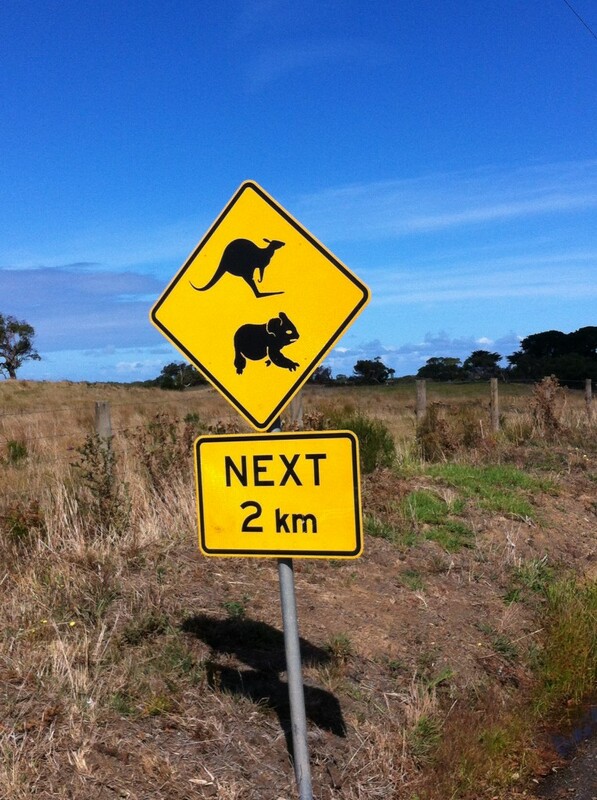 And of course there is a lot of Australian wildlife on the roadside, so keep your eyes open. How did we arrange our Melbourne to Sydney campervan trip, what was our itinerary and how was the whole drive like? You can read about that in my main post Melbourne to Sydney Drive along Coast.